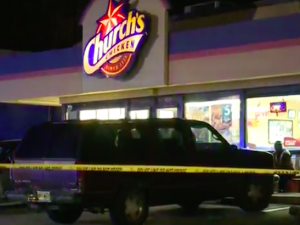 Church’s Chicken Shooting, Atlanta, Leaves Employee Injured; Will Victim Seek Justice and Compensation? Could this senseless workplace violence have been prevented are justice and compensation available to the injured employee? Gunfire erupted “outside of the Church’s Chicken on Cleveland Avenue around 10:40 p.m. Saturday,” December 29, 2018, according to 11 Alive. Police told FOX 5, a female employee was transported to Grady Memorial Hospital with a gunshot wound to the abdomen. Shooting investigations occurred at other Georgia Church’s Chicken locations in October 2018 and February 2018, per AJC and WSB reports. The harrowing incidents raise questions over late-night fast-food restaurant employee and patron safety. Read Our Legal Take below to find out if the victim may have legal avenues for civil justice as well as claims for substantial workers’ compensation benefits in Georgia. Restaurant employees have a right to feel safe and secure in their workplace. The Murray Law Firm questions the level of security provided at the property and whether this senseless shooting may have been prevented. What employee training and late-night security measures were in place to deter crime and protect the victim at the time of the shooting? The Murray Law Firm has recovered millions of dollars for victims of workplace injuries in Georgia, and recently obtained a $29.25 million dollar verdict for a victim of unsafe work conditions in a Fulton County court. The information contained in this post is from secondary sources and may therefore contain inaccuracies. We will gladly correct or remove this post upon request. The material contained in this post is not intended to constitute legal advice. As each Client is unique, please contact us for a free consultation on your particular case. “Contingent attorneys’ fees” refers only to those fees charged by attorneys for their legal services. Such fees are not permitted in all types of cases. Court costs and other additional expenses of legal action usually must be paid by the client.